Last year I was invited by NASBM (the National Association of School Business Managers) to be on the stakeholder working group to develop Professional Standards for School Business Managers. A number of other SBMs from around the country and I worked with Stephen Morales, executive director, and the trustees to write the standards which were launched at the NASBM national conference on 18 November 2015. The role of the school business professional has developed markedly over recent years and there are many more SBMs than there were five years ago, let alone ten years ago. The National College developed a suite of qualifications known as the CSBM, DSBM, ADSBM and Business Director Programme. The National College no longer offers these qualifications but a number of providers do offer them at Levels 3-7. They form an important foundation of knowledge and theory for practising and aspiring SBMs. However, a mature profession takes ownership of its values and the qualifications required to fulfil the requirements of the SBM role at each level. The NASBM Professional Standards start us on this journey. They set out a framework which will be relevant for many school ‘back office’ staff and provide a career development path. 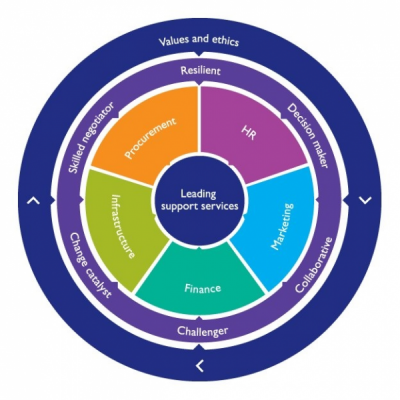 For NASBM members there is an interactive version of the standards wheel (see image), where members can self-evaluate against each of the areas of competence. Over time, the idea is to develop or recommend training and exams which develop the SBM practitioner at each tier. The decision to include different tiers of expertise recognises that this is a profession which has professional development routes. The range and scope of SBM and back office roles in today’s schools is vast and it was felt important that our standards recognised this. It is in line with other professions (such as CIPFA or CIPD) and I believe it enables practitioners to continuously develop and learn. The Professional Standards focus on the qualities of the SBM as well as the core areas of expertise and knowledge that are required overall and the standards will prove useful for SBMs to evaluate their own practice but also for Heads/Principals and Governors to develop job descriptions. It will help identify areas for professional development, especially for those who wish to progress within the profession. What is being said about the profession? One keynote speaker at the NASBM national conference was Education and Childcare Minister, Sam Gyimah MP. In his speech he said: ‘The role encompasses far more because the distinction between the back office and the frontline is false. You are all part of the frontline. I was heartened to hear a government minister make such a strong statement in support of the school business management profession. Despite several years of difficult funding, the focus has been on head teachers leading and managing the finance function as well as the developing the teaching and learning. This speech clearly recognised the contribution a good SBM can make in shaping the direction of a school and ensuring funds go into the areas that will make the most impact. The ability to advise on strategic financial planning is a key skill and central to SBM’s wider competencies. The development of business management as a profession has been close to my heart for a long time and being asked to participate in the professional standards project has been one of the highlights of my year – if not my career. As well as the standards I, as a NASBM Fellow, am signed up to these values and ethics. I like having a clear code to shape how I approach my work and how I make decisions. I fully support the direction NASBM has taken in starting to define what SBM professionalism looks like and look forward to the journey forward to Chartered status.